The primary goal of this program is to create an interface for your Bitly data. Bitly Interactive: Part of the interface. Click image to see larger version. Find instances of the string BitlyQuery, or something similar, in each file, and change them to BitlyInteractive. If you are working in WebStorm, also update the name of the project by right clicking on the top node in the project view and choosing refactor. Your program should be able to load data either directly from the Bitly website, or from a JSON file stored in your public directory. As a result, you will need a Bitly account, and you will need to create at least a few bitly links. Once you have done that, go to the bitly API home page: http://dev.bitly.com/. You should always be able to find a link to the API page under the more button at the bottom of the bitly home page, and at various other places, such as on the tools page. On the right, at the bottom, choose Manage my apps. Generate a Generic Access Token. Save the token somewhere you can find it. For instance, in control.js, or create a README.md file for your project and put it there. It is probably a good idea to keep both the program and your unit tests running at all times. To do this, you need to open two terminal windows. boot up the program normally: npm start. You probably want to focus on the terminal window that contains your unit tests. The other one is necessary to run you program, but you will probably need to view it much less frequently. Both programs should continue running automatically, and will restart each time your change your code. The main exception would be changes to the karma config file, which would require a manual restart of your tests. Delete the variable declaration assigned to your bitly object. Don't stop working in jsonlint until your code passes their test. You must be working with valid JSON or you can't retrieve it with getJSON. When you are done, paste your cleaned up code back into your file, entirely replacing its contents. NOTE: Don't attempt to make the changes by hand, instead delete all of the old contents and replace it with the new code that passed jsonlint. Experience has taught me that this is the only reasonably safe way to do this operation. Don't forget to delete the comments at the top of the file. Make sure your getUrl and getBitlyLinks methods are as shown in this document. They have been messaged slightly from the version in BitlyQuery. Ideally, these don't require any extra work on your part; they are just there to ensure that your implementations of getUrl and getBitlyLinks are correct. In particular, they check to ensure that your code can distinguish requests for the local url (-1) from the url that contains an access token. 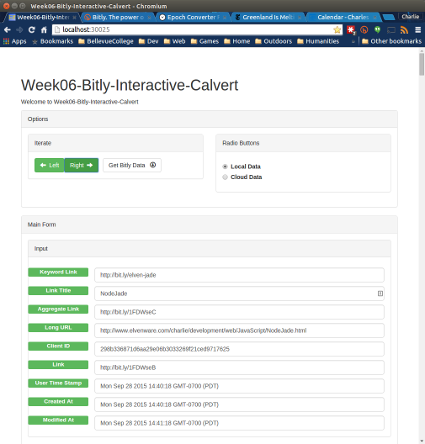 Take a look at the updated BitlyQuery assignment, as these tests are now included in that assignment in their proper context. These should appear as the program loads so the user sees them by default. In other words, call your method that contains your getJson method from your document ready function. Convert an epoch date used in JSON to a human readable date. The next two sections describe how to perform these relatively simple tasks. // YOU DON'T GO PAST THE END OF THE ARRAY? Don't forget to modify layout.jade to include links to these files. In my opinion, at least, function objects are much more flexible and powerful than plain objects. I would put code like this in my document ready handler. By default, our Gruntfile has been set up to display output in result.xml in checkstyle format. This does not work well on Cloud 9, and can be confusing to beginners. To fix the problem, switch from checkstyle to jshint-stylish. The live data from your Bitly account? Include two radio buttons that allow the user to make this selection. If they select the local option, then call getBitlyLinks with an argument of -1. If they want the live data, then pass in the access token to your account. NOTE: Ultimately we will want to make the call to the live Bitly data on the server side so the user cannot see your access token. We aren't doing that yet, however. Test fixtures are created to help us set up the environment for our tests. Generally, they involve creating a fake, or ideal, environment that cannot fail. When our tests run against that environment, we can be sure it is the code we are testing that is failing, rather than the environment in which it runs. When we SpyOn a function we are set up a fixture. In particular, we create a fake version of getJSON that is more or less guaranteed not to fail. In this section, we will create another fixture: a few lines of HTML that we use in our tests. Suppose further that this code gets called by our unit tests. Since at least one branch in this if statement is sure to execute, we need to be sure it will not throw an error. We put the HTML for our checkboxes in a string called fixture. After the test is done, remove the fixture to ensure that one test does not rely on the results of another test. With this code in place our calls to document.getElementById succeed and our tests pass. If it takes you a moment to wrap your head around this, please sit back and read all this again. It is an extremely useful technique, and one that can help us write much more robust tests. Place your code in your repository in a folder with the name specified above. When you submit the assignment include the url of your repository and/or the folder in which the code you created resides. You can also include a comment of your choosing.